Walking through the freshly renovated and re-opened Canadian Museum of Nature in Ottawa the other week, I was pleased to see the school groups and families enjoying the museum experience. 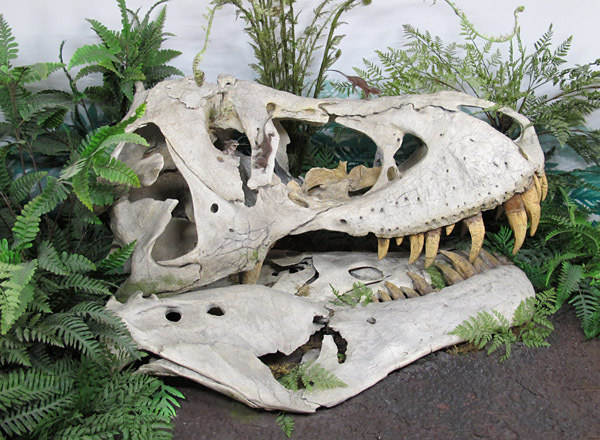 There are some excellent new exhibits, and the visitors were busy with the obvious crowd favourites: the big dinosaurs, the blue whale skeleton, the splendid mineral cases. I was enjoying the exhibits too, but as a museum person I tend to get distracted by technical details: word counts, case design, floor plans, materials, and lighting. Always lighting! 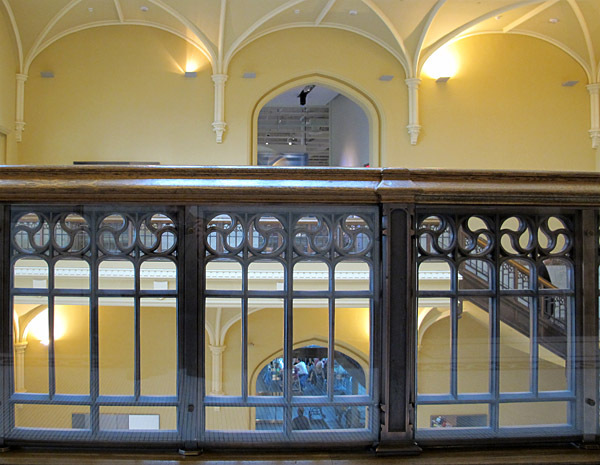 I also try to look for the good things that other visitors might not take in: the small details that give exhibits extra impact, and the less obvious fossils, building stones, and architectural details. 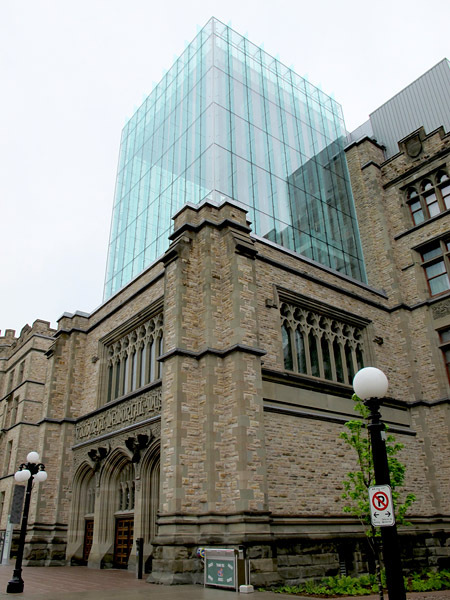 The Victoria Museum building has just passed its centennial; its “Scottish baronial” architecture may lack the exuberance of some of its Beaux-Arts counterparts, but it still holds some interesting features. And of course there are all sorts of treasures hidden between the dinosaurs. The Horsefly and McAbee are wonderful fossil-rich sites of Eocene age (a bit more than 50 million years old), in the interior of British Columbia. 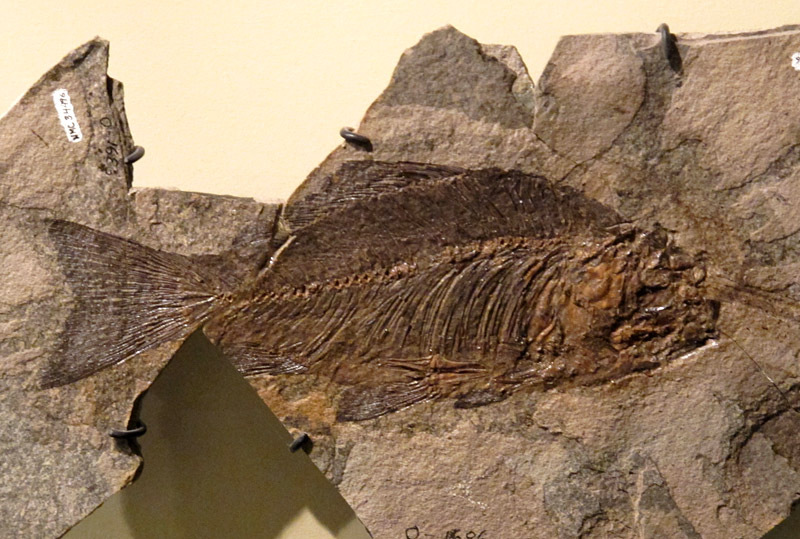 The fossils occur in sediment that had been deposited in basins between the mountains; they include life forms of forests, lakes, and swamps. As the small exhibit near the back end of the paleontology gallery demonstrates, these fossils are special, some of the best-preserved anywhere in the world. 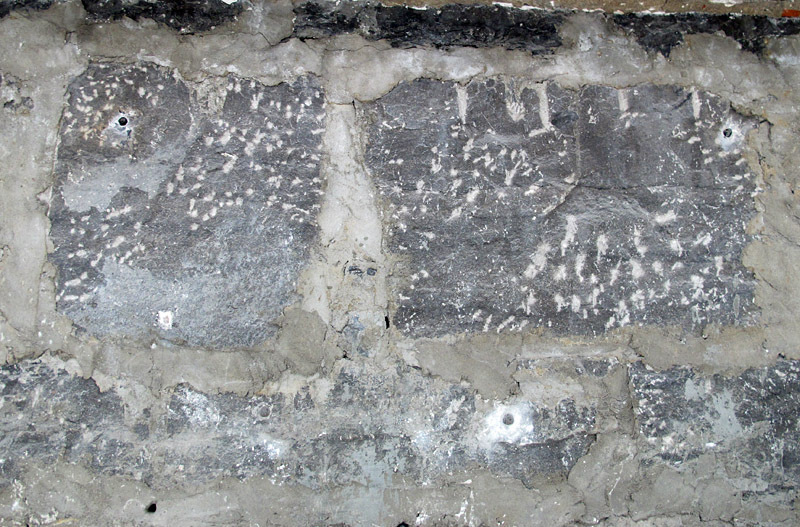 Where foundation and wall interiors have been left purposely exposed by the renovation, you can see that much of the structure is supported by blocks of locally quarried dark limestone, mortared together. I wasn’t able to determine what unit these came from, but I am guessing that they are of Ordovician age, remnants of an interval during which the Ottawa area was covered by warm seas. 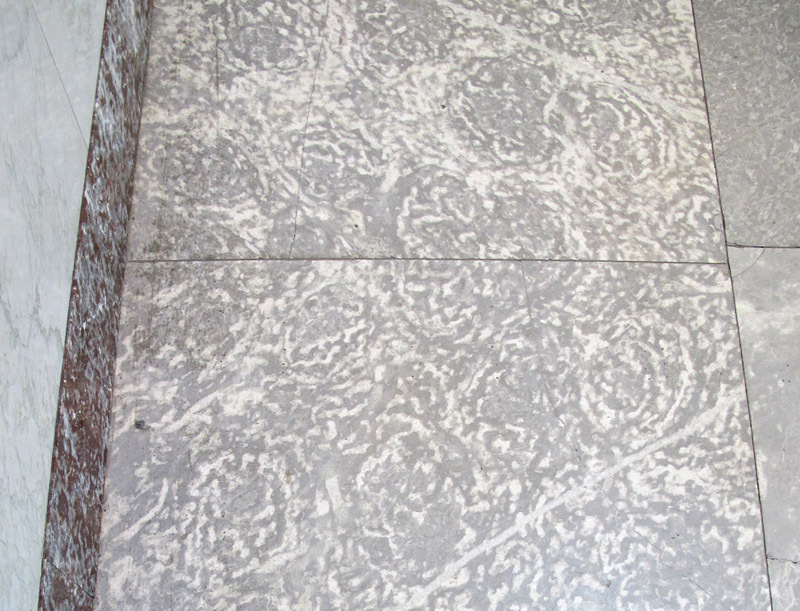 The staircase landing floors appear to be “Missisquoi Marble”, a building stone also seen in structures such as the Parliament Buildings and the Manitoba Legislative Building. 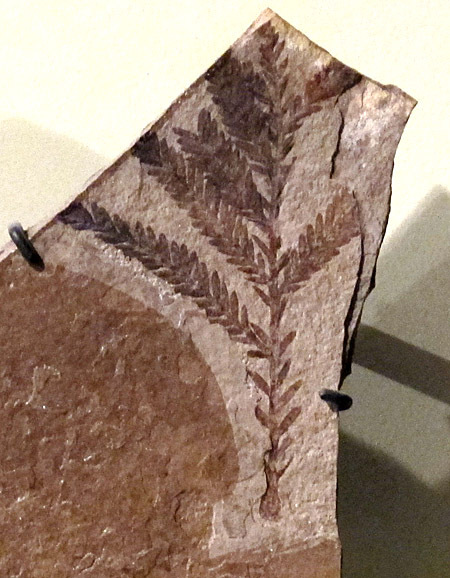 This distinctive stone, part of the Strites Pond Formation from quarries in Philipsburg, Québec(near the US border), is Late Cambrian to Early Ordovician in age, so a bit less than 500 million years old. The grey “swirls” represent cuts through dome-shaped cyanobacterial mounds (stromatolites) that formed on an ancient shallow seafloor. The outside of the building features carvings of various Canadian creatures. 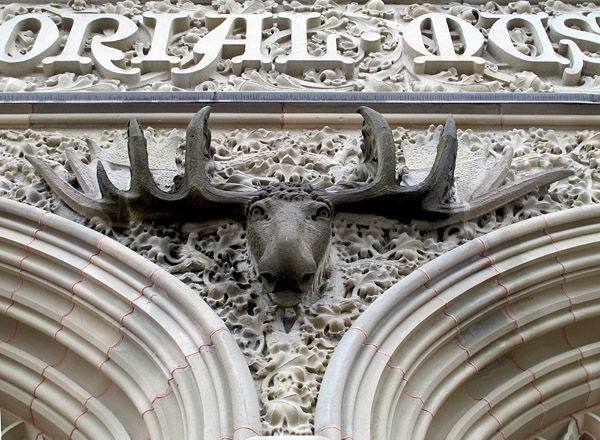 This head over the main entrance seems intended to represent a moose, though to my eye it would be a moose that includes at least a hint of Bullwinkle. Or maybe it is a caribou, or some sort of generic multi-purpose cervid? 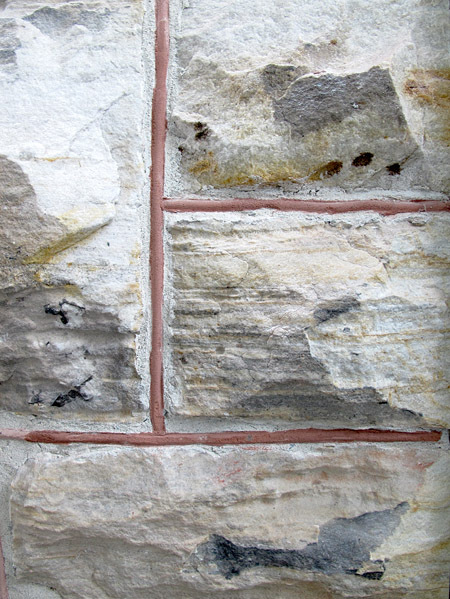 The building’s exterior is graced by this attractive and apparently durable local sandstone, which is also exposed in a few places in the interior. The Nepean is part of the Potsdam Group, an Early Paleozoic unit that blankets the Precambrian Shield over a large area of eastern North America. The Nepean consists of sediment deposited in a low area known as the “Ottawa Embayment” and is thought to be of Early Ordovician age. It thus dates from much the same time that the Missisquoi was forming in Québec; it is rather pleasing that they have been brought into close proximity with one another. What can barely be seen from the visitor’s vantage point is the way in which the artists have imbued these creatures with a varmint quality that could be nothing but mammalian. 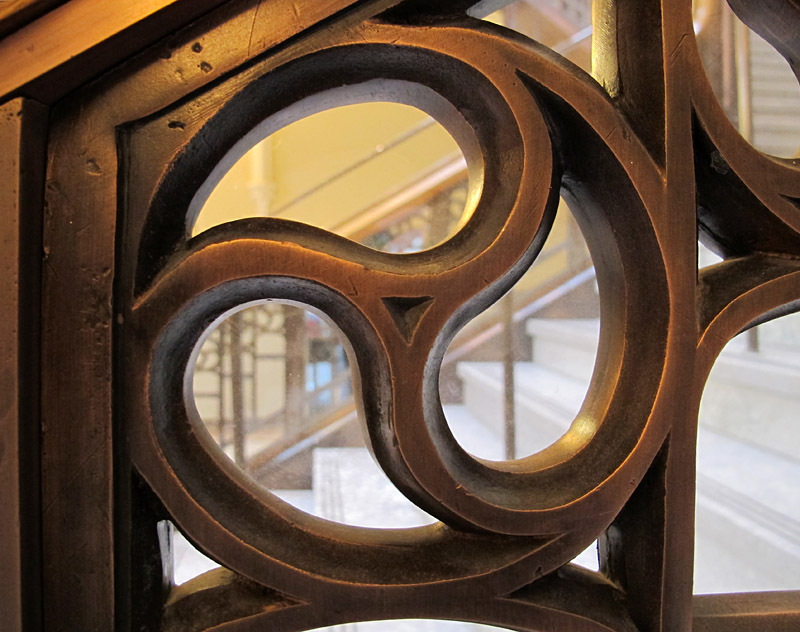 … which looks shockingly similar to the Ediacaran problematic fossil Tribrachidium, which hadn’t even been discovered at the time the railings were designed. The decorative red marble on the stairs is a Cretaceous limestone that is full of rudists. These were unusual bivalved molluscs that grew odd coral-like shapes and formed reef structures on ancient seafloors. 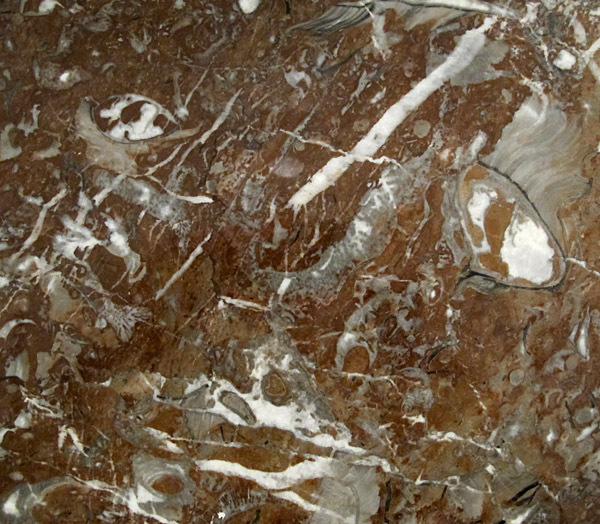 They are abundant at sites in southern Europe, which is the likely source for this beautiful marble. 9. Sheep, Goat, or Alien? 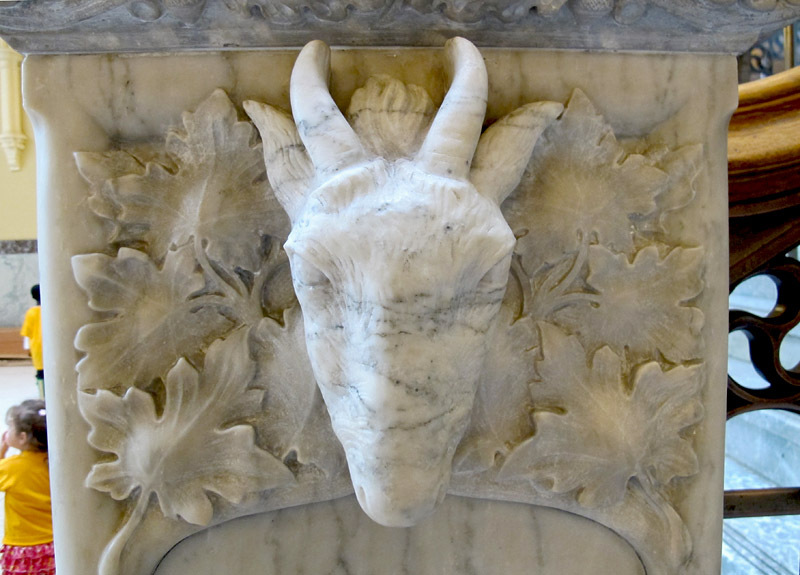 This carved head at the foot of the stairs may represent a young bighorn sheep, though it looks rather more like the offspring of an ill-considered liaison between a goat and an alien. 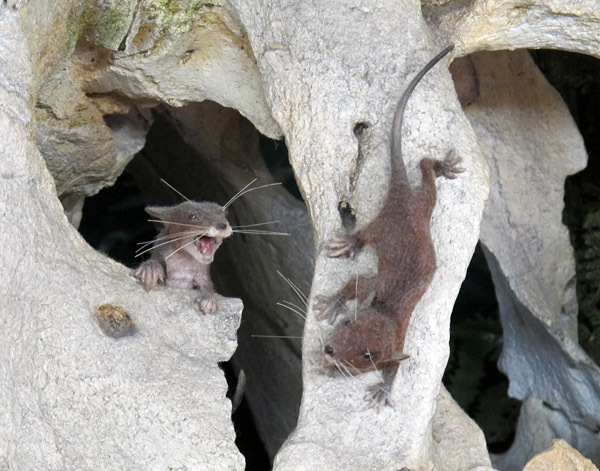 It seems to share its large-eyed malice with the “dinosauroid,” a big-brained biped that was proposed by Dale Russell as the possible outcome of theropod evolution (that is, if the asteroid had not fortuitously caused their extinction). At the time he suggested this, Russell was a scientist at this very Canadian Museum of Nature. *And yes, I realize that this shape is a “standard” decorative form. **I know that we could just ask Russell about this, but it is always more fun to speculate. I am always very impressed with the way you work the English language. You have an open, accessible narrative style that most museum text writers would kill for and are never able to master. I don’t know if it is, but it certainly appears effortless. I, too, walk through museums and look at everything with a slightly (and sometimes overtly) critical eye toward didactics, lighting and interpretive elements, but evidently I don’t see half of what you do. This was a really enjoyable read for me. Thanks for sharing. Maya, as always you are very kind. No, it is not effortless, but I don’t have to rewrite that much these days. I suspect I have put in my more than 10,000 hours of writing practice! Very interesting, Graham! Thanks for sharing. And Maya is right–you do have a great flair for writing. You can break down discoveries and concepts in a way the layperson will understand. Nice post, echoing our conversation during your visit. When I was at the CMN in late May I was struck by the same thing I often see in the behaviour of many museum goers, especially children. 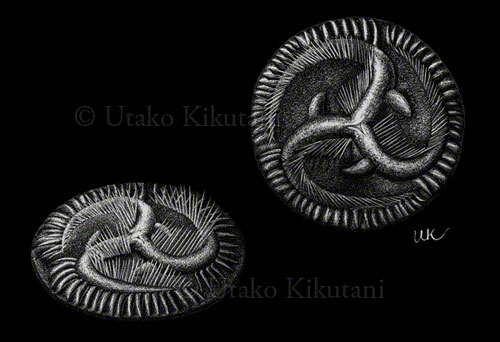 As you note in your post, the fairly new Talisman Energy fossil gallery is very good. I particularly enjoyed the dinosaur replicas (a set piece of predatory theropods attacking a herd of herbivorous ceratopsians), but these are common at museums these days (but it was still very good, even if they did get the plants wrong! ), but especially the Tertiary gallery with (as Graham points out, the McAbee plant fossils) with its family group of the giant mammals, the brontotheres. Which is where the strange museum-goer behaviour comes in. A young family group was touring the gallery and felt it necessary to dangle their toddler over the glass barrier in front of the brontothere replicas for a family photo. Apart from the danger to the child, and his obvious distress, there is my sense that the museum and its exhibits were entertainment (OK, no problem) but in the same sense as Madam Tussard’s wax figures or the snake man at a sideshow, not as a place to learn fun facts about whacky ancient life. A troupe of little boys running through the gallery and stopping briefly at the computer stations to press buttons randomly before resuming their dash, topped it all off. Mum and dad showed little interest in reading any of the explanatory panels and in response to rare questions by their children offered lame and wildly inaccurate answers (the feathered dinosaur was a ‘weird bird’), when the real answer was in plain sight in nice big text. Perhaps I was there on an atypical day, but I fear not. I would be interested in other perspectives, and love to discover that my pessimism is misplaced. 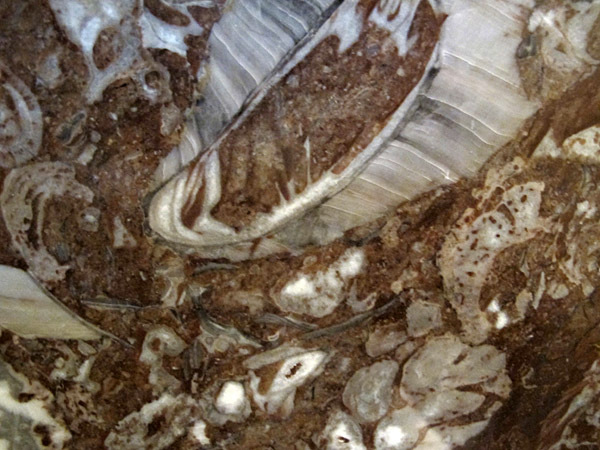 ps all of the computer-assisted interactives from the Talisman Energy Fossil gallery are available on the CMN website. The behaviour of museum visitors is a whole other topic! Those of us who develop exhibits tend to assume that we can provide content that will be absorbed by the visitors, but of course that is often far from the case. We have to assume that groups of visitors will combine interaction with the exhibit and interaction with one another, and that parents will want to explain things to their children. I think that, for this purpose, it is incumbent on curators and designers to place 30 words of critical information in a very obvious location, in the hopes that they will at least glance at that! I have heard just that same sort of “interpretation” by parents who don’t bother to read; I guess we should be grateful that they are at least taking their kids to a museum. Interestingly, I have noticed that the exhibits that transmit the most knowledge to visitors are often those with few words (in which knowledge is transmitted in other ways). Our Ancient Seas exhibit is a case in point – I am struck by how much family groups seem to learn in that exhibit. I would like to use your image of Amyzon for a not for profit book I am writing on The Fishes of Eastern Washington: A Natural History. I will make about 500 copies. Thank you for your attention to this matter. Thanks Allan. I have no problem with you using the photo, but the Canadian Museum of Nature may require you to deal with them for copyright and for cataloguing information for citation, since it is their specimen. Blogs such as mine are sort of “grey territory” for copyright issues, but books are much more clearcut! I am happy to send you a higher resolution version if you don’t mind checking with them about copyright. Wonderful Graham, your observations are excellent! I will visit with a new perspective.